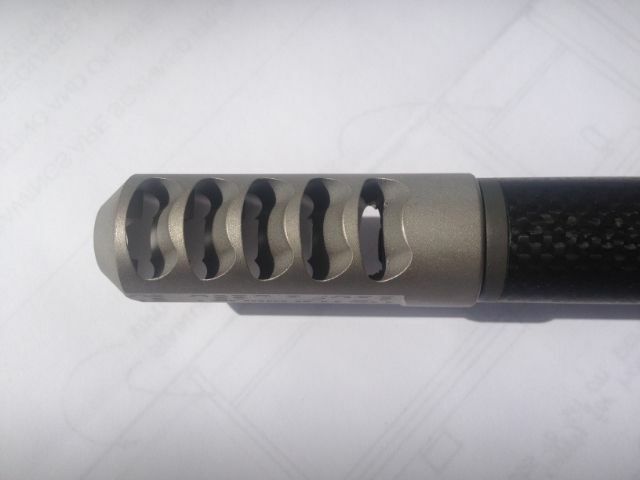 Thread: New generation T3 Muzzle brake. 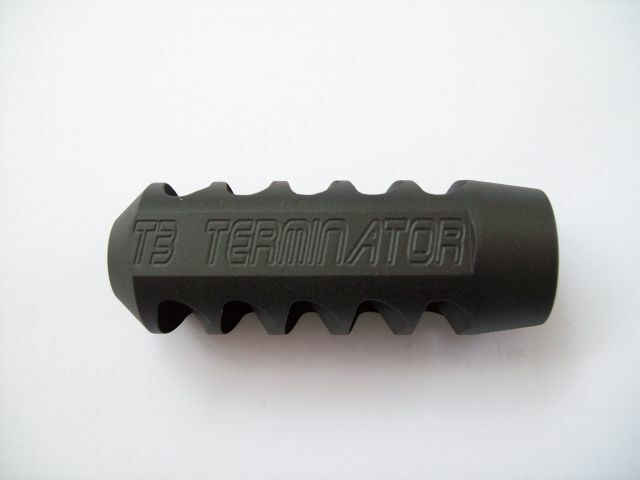 Just got my revised T3 Terminator muzzle brakes today. They are 25mm diameter, 69mm long & weigh 95-100 grams. I have modified the design so they can be fitted to muzzles up to the same diameter as the brake. I have kept the flats so they can be timed easily & will take a spanner. Here it is on my CA10. Philipo, veitnamcam, Bryan and 1 others like this. Does the extra port make much of a difference? In previous tests I have conducted, removing a port does reduce the brakes effectiveness. Obviously having a brake with 15 ports would be silly, it would work, but diminishing returns really start to kick it. It is always a compromise between size & effectiveness. 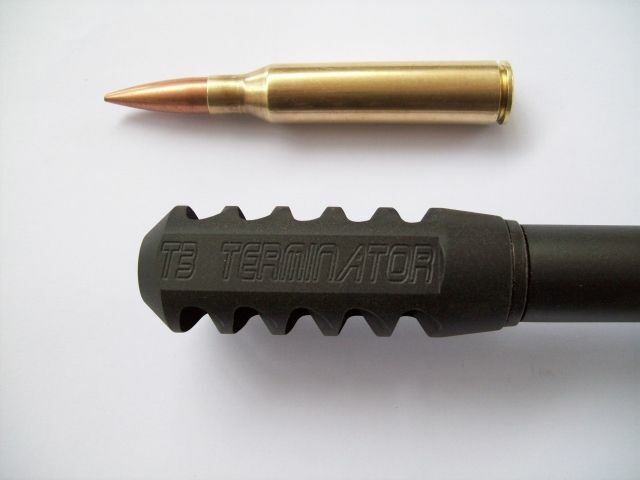 This T3 is smaller than the original T3, closer to the T2. 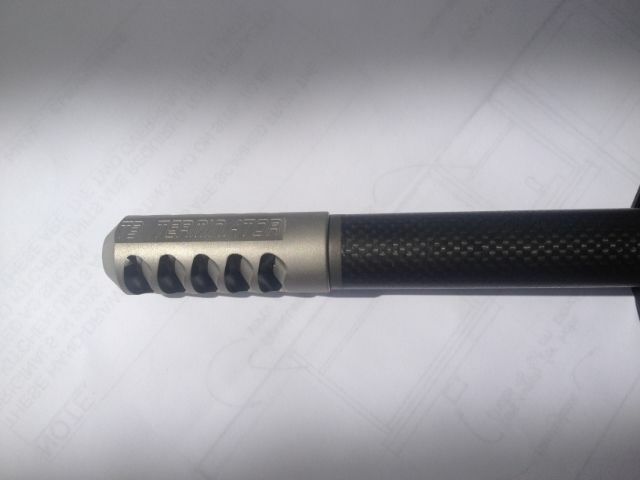 The T2 worked just as well or slightly better than the T3 in certain calibres, which is why I decided to redesign it. Years ago I used to shoot NRA Action pistol, with a .38super modified 1911 race pistol. This pistol had a huge compensator (pistol talk for a muzzle brake) and one day an engineer at the club asked if he could have a look at it. He proceeded to wrap making tape around it, then asked me to fire it! To my surprise the last port still had making tape on it, then the next one back had only just broken the seal, the remaining ports closer to the barrel had all torn the tape well and truly off. Long story short a hack saw cut and one minute in my lathe had the huge compensator reduced in size with no noticeable loss in recoil reduction, and a much easier pistol to handle as a result. Some sometimes less is more. Last edited by kimjon; 07-11-2013 at 07:46 PM. Oh and forgot to say they look good. DAF, Spanners, madjon_ and 5 others like this. Spanners and Kiwi Greg like this. I just got back from the coaters a T3 that I fitted to a Savage 338 Lapua Magnum. Here it is on the muzzle with a 338 Lapua round. 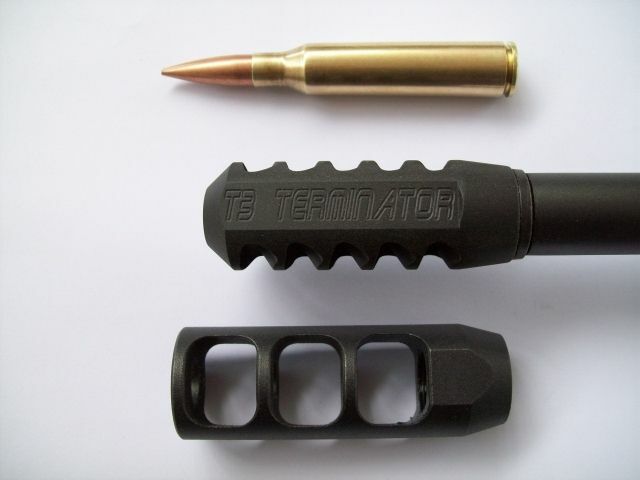 Here is a short video showing the T3 Terminator muzzle brake compared to the factory, HS Precison HTR, Rem 700P, Savage 111LRH, Sako TRG, 338 Lapua Magnum ones. madjon_, Neckshot, Toby and 1 others like this. Kiwi Greg and Toby like this. veitnamcam, Kiwi Greg and BRADS like this.